Another day, another apocalypse. In Joe Hill’s latest novel, the apocalypse is brought about by a virus, nicknamed dragonscale. Dragonscale causes people to exhibit black and gold tattoo-like markings all over their bodies and, when stressed, burst into flame. The sudden onset of this disease, creating conflagrations across the globe, leads to a societal collapse and a clean-versus-infected mentality in the population (at least in the United States). “Cremation crews” scour the countryside looking to kill the infected in order to stem the spread of the disease. But unlike most epidemic apocalypse books, The Fireman is on the side of the infected who find that dragonscale may not be quite as fatal as people first think. The centre of the The Fireman is not the titular character but a pregnant nurse – Harper Willows. Harper is a great character – compassionate, resourceful, steely when she needs to be – and fairly kick-arse, even when nine months pregnant. In fact most of the characters with significant agency and personality in the novel are women, a point which Hill can’t help but pat himself on the back for and reference directly in one passage of dialogue. And while there are some women who are not so good, all of the fairly clichéd, violent, gun-toting “bad guys” are men, mainly of the redneck American variety. The Fireman is in some ways a small novel. There is a global pandemic but the action generally limits itself to a small corner of New Hampshire, moving into Maine for the final act. There are no grand plans to save the world just an intensely personal look at how the main characters interact. A key aspect of dragonscale is its ability to make people glow when they are in harmony. This aspect of the virus allows Hill to explore, in a metaphorical sense, the good and the bad of social networking. It is this thematic element that lifts The Fireman, which is already an effective post-apocalyptic survival tale. The Fireman and its characters are extremely pop-culturally aware, as a reader might expect them to be. Harper is a big fan of both Mary Poppins and Harry Potter and often relates her own experiences to these cultural touchstones. But plenty of post-apocalyptic fiction gets a mention from the Walking Dead to the Hunger Games to The Road. The only problem with this is that it reminds you how common the post-apocalyptic tropes are – the place of safety which is corrupted by power, the vengeful pursuer who seemingly cannot be stopped, the mythical destination where a cure might be found. Joe Hill uses them all. But somehow, despite their awareness of the similarity of these elements with their situation, the characters do not spot the warning signs and so there is often a sense of inevitability about how each scenario will play out. Hill is extremely adept at getting readers to turn the pages, particularly with little stings of foreshadowing at the end of key chapters (“But she did not return until long, long after dark fell, and by that time everything in camp had changed again”). While the narrative does slow down dangerously at times for extensive infodumps of backstory, Hill keeps the momentum and sense of peril high enough to push through back to the well-handled action. 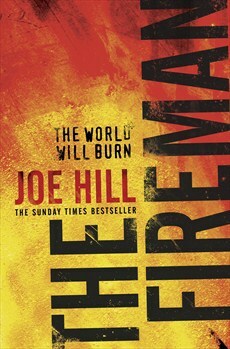 In the end, The Fireman delivers a rattling good postapocalyptic yarn. An edited version of this review first appeared in Aurealis #91, Australian Science Fiction and Fantasy Magazine, www.aurealis.com.au.